My son had to tag along with me to work the past couple days. He wasn’t all that thrilled. So when we finally got home, I told him to ‘get to work’ at his own job. 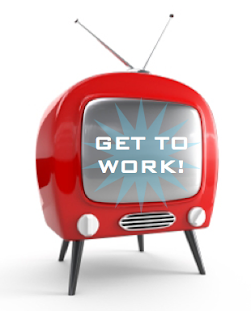 And he darted for the TV full speed ahead with a big smile on his face. Yeah… my boy has a pretty cool job. He had the opportunity to test a video game. Or should I say dance video. 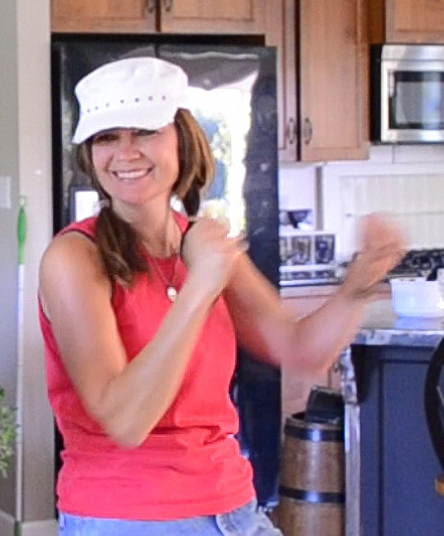 So we took the challenge and shook it up with The Smurfs Dance Party! That’s what I thought too. Until we cranked up the volume, selected the songs we liked and went for it. The (human and cartoon) characters based from the current Smurf movie dance on the screen offering just yourself or multi players to copy cat their moves for points. Your movements are picked up via motion sensors through the Wii remote you hold in your right hand, which rack up points based on your accuracy. The dance routines are graded from simple to moderate. Once you get more familiar with the routines, you’ll work up to getting a little fancier with your moves. Copying a cartoon figure is a little trickier to follow than a human however you get it pretty quick. You also have the choice of dancing to just songs or alongside a story, which will further captivate the younger crowd for certain. Is the music any good? 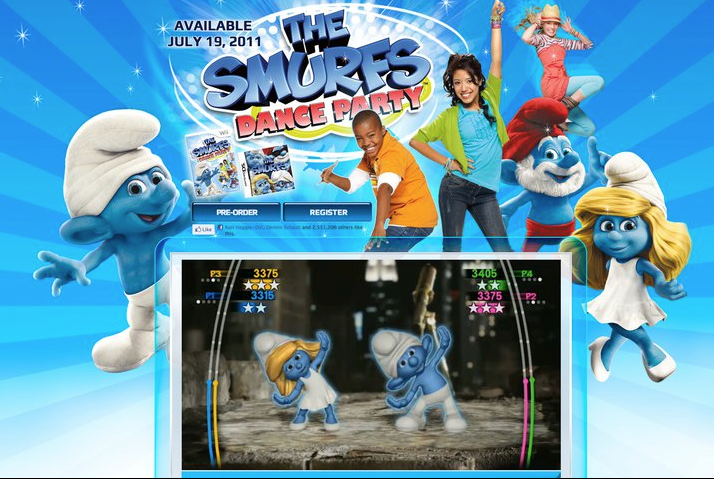 Although the concept of dancing with Smurfs is young, the fun factor fits with both kids and adults. It’s fun exercise! My 12 year old son wants to turn it on frequently. Warning: allow your kiddo to play this and you’ll soon be leaving your dishes requesting a turn. 🙂 This is one electronic play thing I’m happy to have running in our home. Have you tried any of the Wii dance games? Which ones do you like? Thank you to Ubisoft for sponsoring this UbiChamps blog post. Please click here to learn more about Ubisoft. I was selected for this sponsorship by the Clever Girls Collective, and was given this game in exchange for this review without financial compensation. All opinions are my own. One place you can purchase the video is HERE. Oh Donna, you and your boy are so cute!It’s great to see how you make time for your son. I know it can’t always be easy. I love your blog and the sense of humour you put into some of your posts! They crack me up! Oh, and btw – your home looks lovely, too! I love your video; you both look like you had a awesome time. We love the Wii Fit games at our house. Donna you and your handsome son look like y’all had more fun than the law allows.LOL. and smile on this Monday morning. I can’t believe they brought the smurfs back. Looks like fun…maybe just what I need to jumpstart my exercise routine! Who knew blue could be so fun! 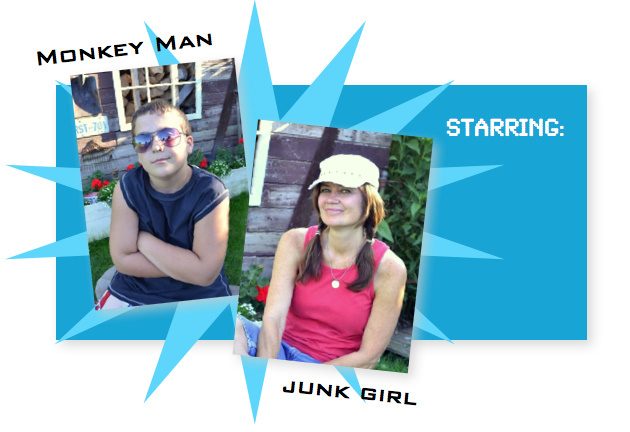 Let the dancing begin…smurf style! Looks like you guys had fun! I’m thinking it’s time I bought a Wii…a good way to exercise and burn calories once the warm (pool) weather goes away. What a great way to spend time with your main man! Fun way to exercise without knowing it! Oh, I am the Queen of Silly! Some of the most memorable moments with my girls growing up were just like your video. Pretty soon they were saying “Mom, is it our turn yet?” I may have to get me one of those Smurf things. For the grandkids. That’s my story and I’m sticking to it. Hey there neighbour!! Looks like you had some fun over there… glad for you…. did you and Monkey Man go see the Smurf movie? Glad to see you are putting some fun into your working summer with Codes! Donna, you never cease to amaze me. You’re either makin’ me laugh, makin’ me cry, or inspiring me. You embrace life in the best way possible, and if we were neighbors, I would pick you as my friend. So I’m just going to repeat myself, and say what I always say to you…….I like you, and I get you……. Thanks for starting my day off with a smile on my face! Wow go and shake it down the two of you. We have a wii but no dancing games. Only sports but we enjoy it a lot. So cute you two are! Looks like fun too, I could get into that goofy kind of exercise. By the way, you are looking very hot!! That is too cool! My 4 year old and I love the Just Dance games. Our favorite is Just Dance 2. His favorite song is “Walk Like An Egyptian” and I must say, he is pretty good at it for four years old! I agree about the great exercise part! God Bless! How FUN was THAT! Made me laugh to see the pleasure of time with your son. I had 4 of those and remember some of the silly times. I LOVE IT DONNA!~ One night at a friends house we did the WII fit dance along..OMG I had a blast,however I realized this girl has no rhythm!. donna ur a hotty! youre looking pretty good these days! monkey and junky.. so cute! I highly recommend Dance Dance Revolution for Wii. It’s the kind that comes with a dance mat. (Might help to put it on a rug if you’ve got hard floors.) It’s a really great workout and I’ve yet to get bored. You can also set goals for time or calories burned, etc. And you can include the hand controllers for added difficulty. You guys made me laugh so hard. I missed you guys on GOOGLE! so much! Keep Smurf Dancing!!! A few months ago my sister-in-law brought over Wii dance II for my two kids and I ended up “battling” it out with my 9 year old daughter on the “african” dance competition and I won! It was so fun and so hilarious to see my husband watching me drop-jawed!! That was awesome. It looked like you guys had a blast and that is why I think wii is amazing. My hubby and I played wii sports even when I was 8 months pregnant, but I always wanted to try the dance games. 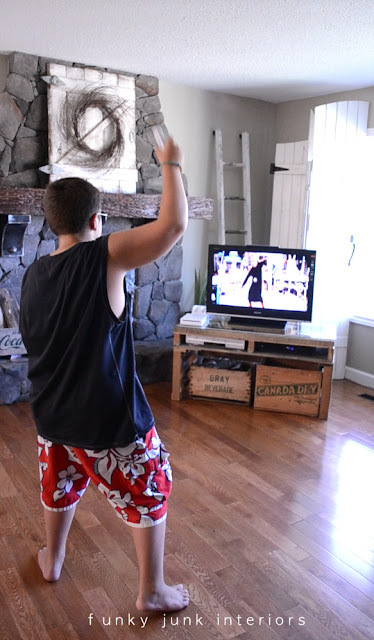 Will you be trying out any of the other wii dance games? Having a boy myself, I hope we will have that much fun together when he is older.